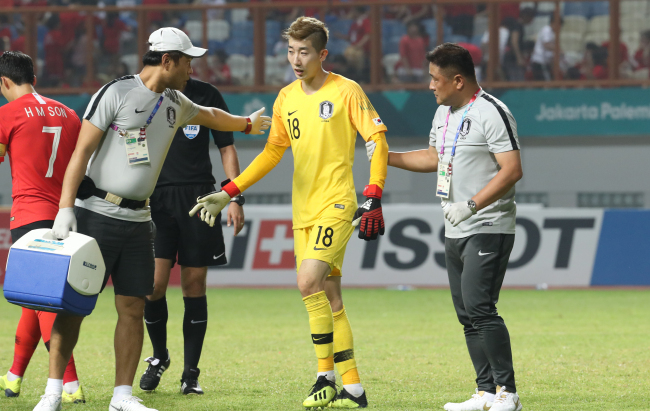 Goalkeeper Jo Hyeon-woo was removed from the national soccer team for a pair of September friendlies on Wednesday with a knee injury sustained during the Asian Games. The Korea Football Association said Jo will not dress for new head coach Paulo Bento when South Korea hosts Costa Rica on Friday and Chile next Tuesday. Jo was South Korea’s No. 1 goalkeeper at the Jakarta-Palembang Asian Games, which concluded Sunday, and helped the country to a second straight gold medal. Jo suffered an injury to his left knee during a round of 16 match against Iran. He landed awkwardly after making a save. Jo missed the quarterfinals against Uzbekistan but returned to action for the semifinals against Vietnam and then the gold medal match against Japan. The Korea Football Association said Song Bum-keun, who backed up Jo at the Asian Games, will replace the veteran in the lineup for the friendlies. Bento has two other goalkeepers on the roster in Kim Seung-gyu and Kim Jin-hyeon.